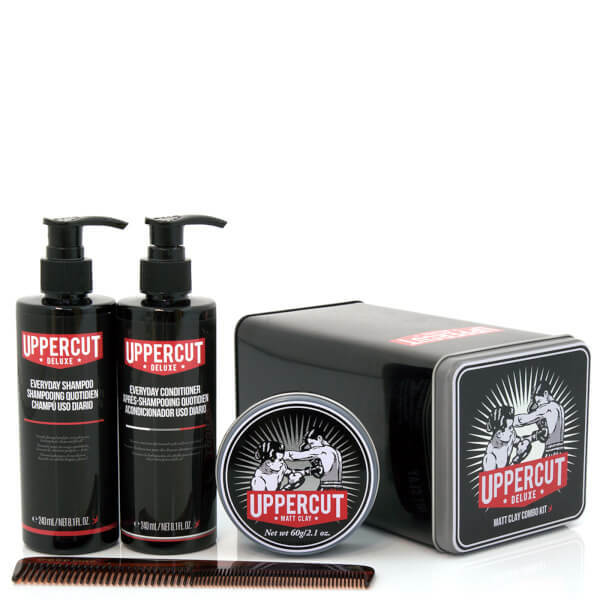 A perfect gift for the well-groomed male. 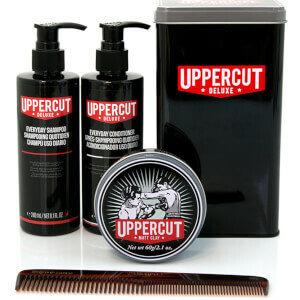 The Matt Clay Combo Kit from boxing-themed brand, Uppercut Deluxe, combines three knockout hair products, a handy comb and a collectable tin. Formulated for daily use, the lightweight shampoo creates a luxe lather that refreshes and invigorates the hair and scalp without stripping moisture. Infused with Liquorice and Menthol to leave you feeling revitalised around the clock. An ultra-hydrating formula developed specifically to replenish and protect men's hair. Fortified with Olive Leaf Extract, the weightless conditioner moisturises and strengthens hair, whilst soothing the scalp for long-lasting comfort. Effortlessly re-shape you quiff, mohawk or slick-back whenever any fine tuning is needed. Giving a firm hold that remains dry and re-workable all day long, the clay is ideal for a seamless transition between casual and professional situations. Matte finish. A modern, yet traditional men's Comb to help you create the perfect hair style. A pocket-sized comb for the well-groomed male, the wide and narrow teeth are rounded for extreme comfort and to achieve a clean look.